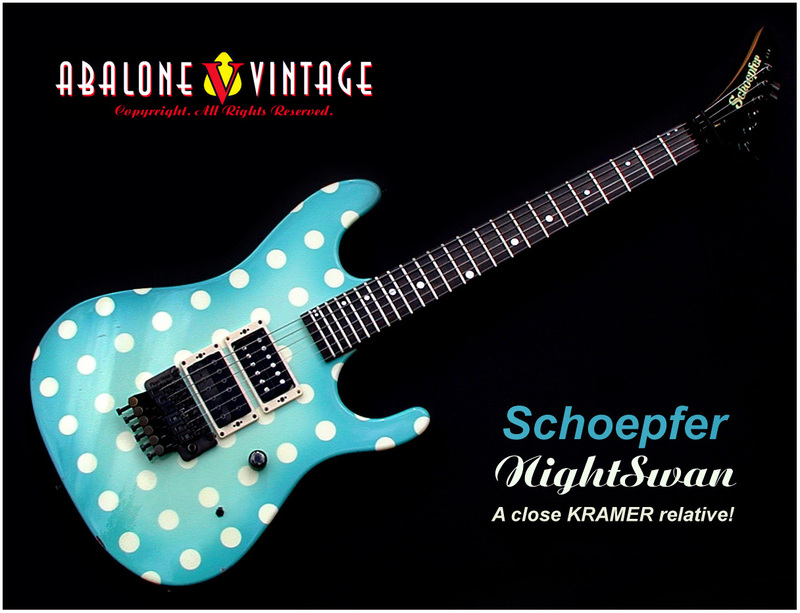 Schoepher NightSwan guitar circa 1990. 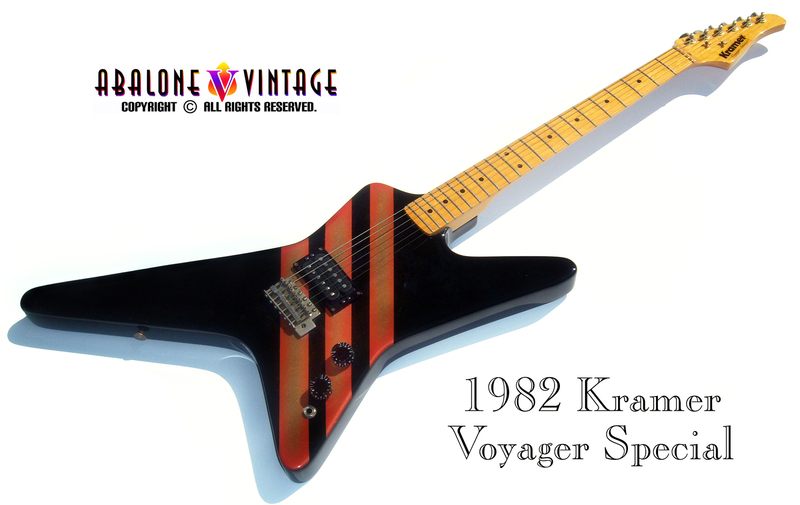 This guitar was made by Rod Schoepfer using existing Kramer NightSwan parts. 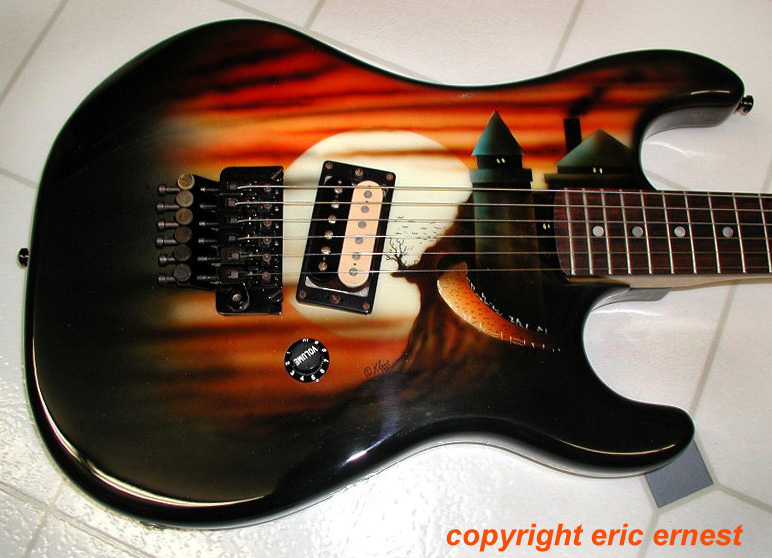 Rod made guitars for Ritchie Sambora of the band, Bon Jovi. The polka dot graphic was one of Kramer's better "simple" graphics. 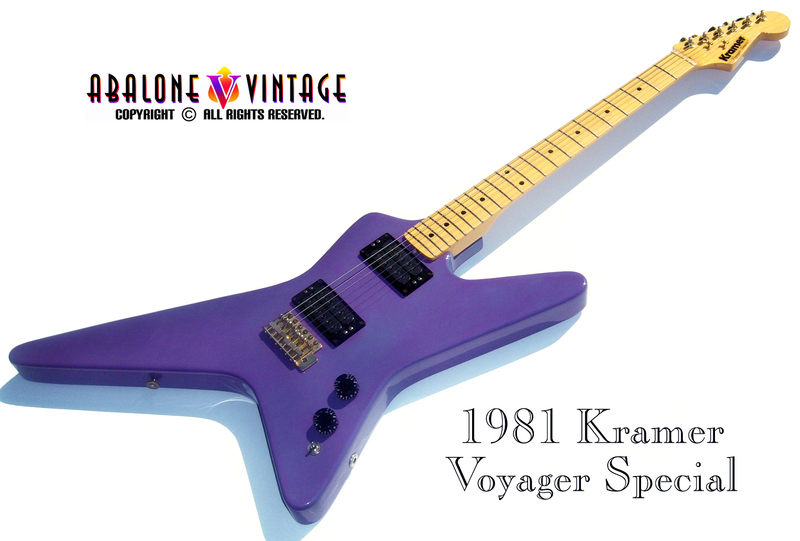 1988 Kramer Sustainer guitar owned by Andy Timmons of Danger Danger. This guitar was commission by Andy's manager and girlfriend as a birthday gift. Andy use to play the Flintstones theme live. to each of the members of band, Bon Jovi. Hard Rock Cafe has two of the five. 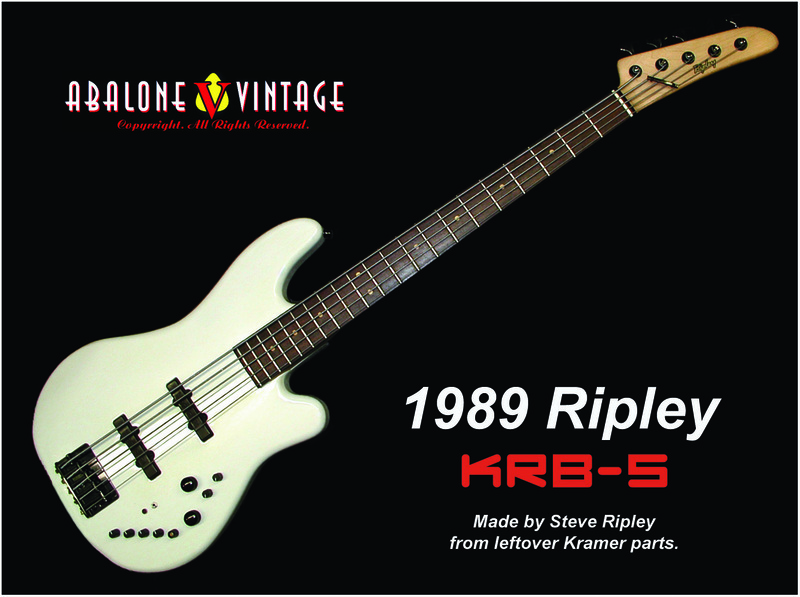 1989 Ripley KRB-5 5 string bass. 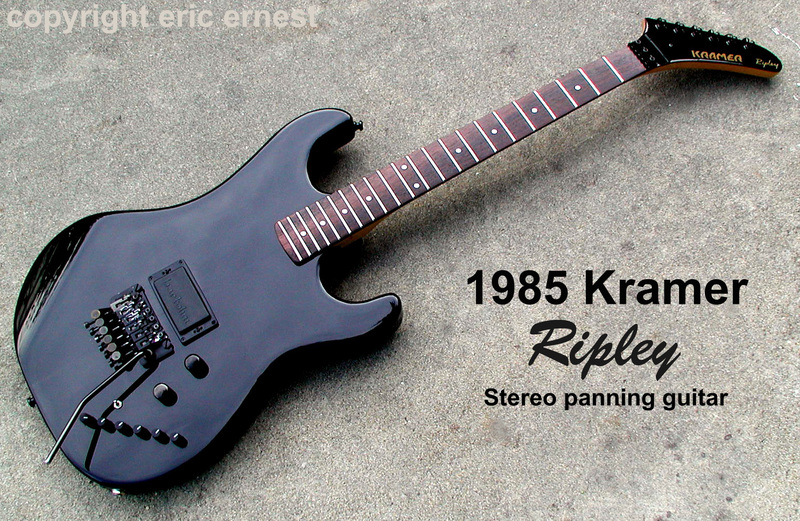 Steve Ripley was a "hired gun" on many levels, and yes, you could hire him to build you a guitar. 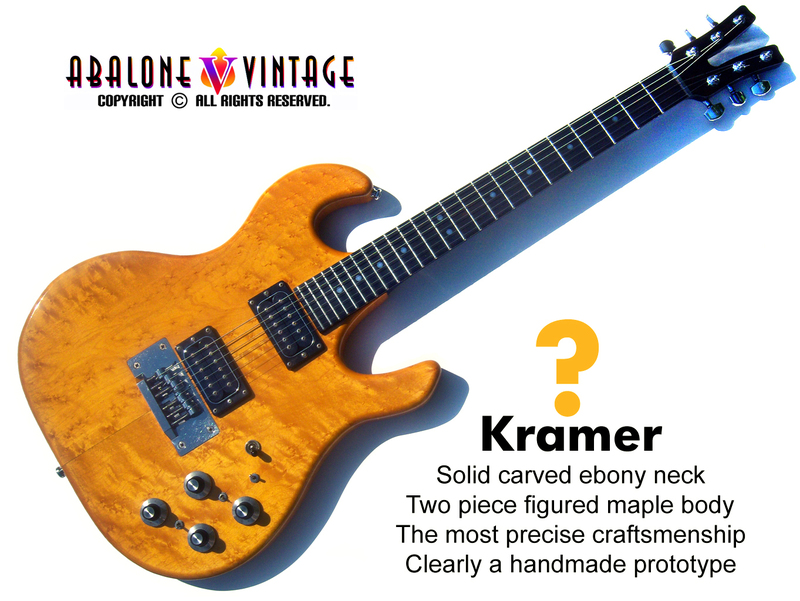 Many Ripley guitars were made with a combination of Kramer and Tom Anderson parts. 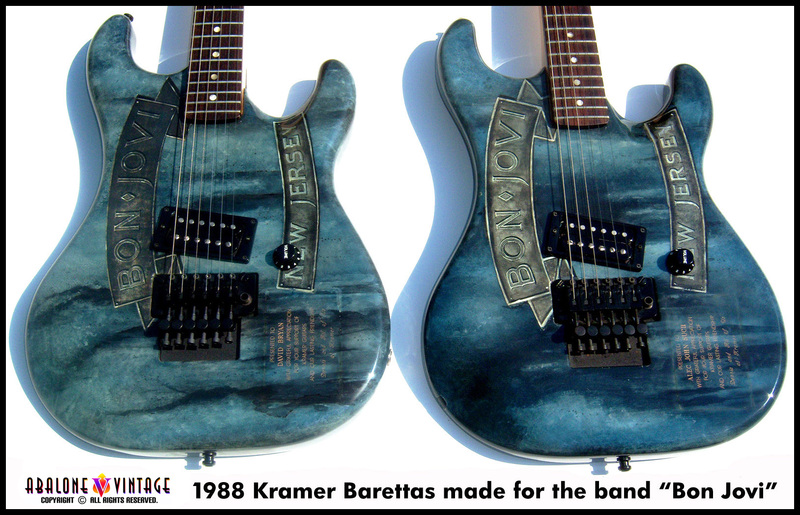 KRAMER Monsters of Rock Baretta graphic guitars. These guitars were never available for sale. 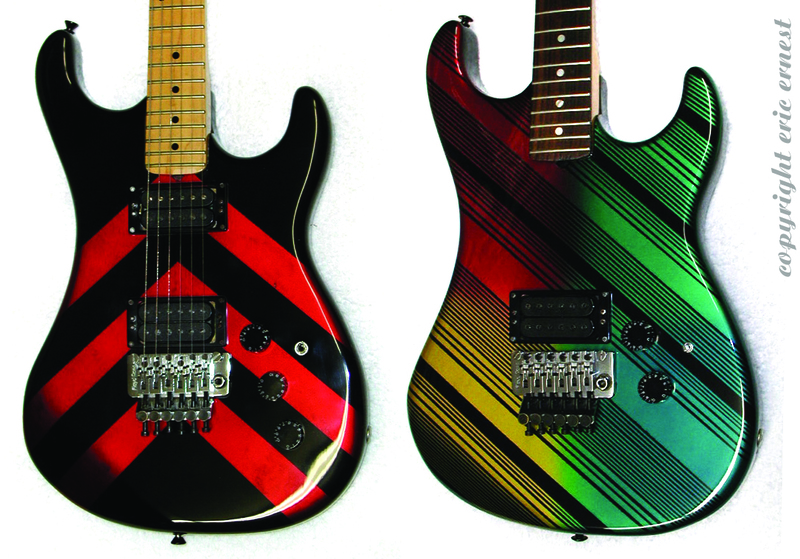 They were given away on tour by Van Halen as a radio promo. get out of the factory unsigned. It is estimated that roughly 50 were done. 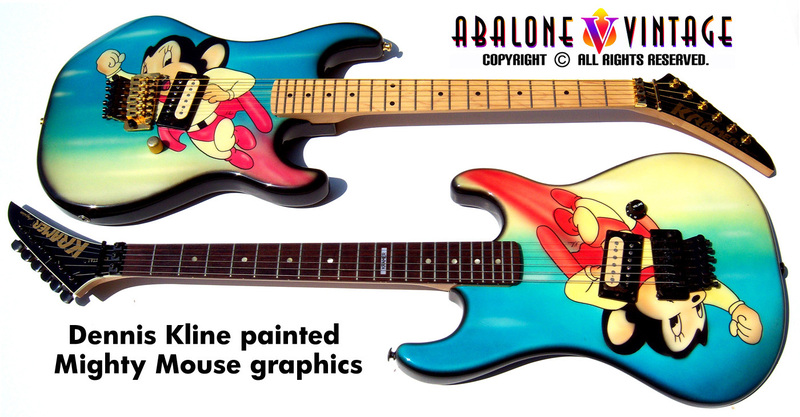 Vintage 1988 KRAMER Baretta guitar with Hindenburg graphic done by Dennis Kline. 15 minutes from the Kramer factory in Neptune. and a great image for the rest of us to enjoy. 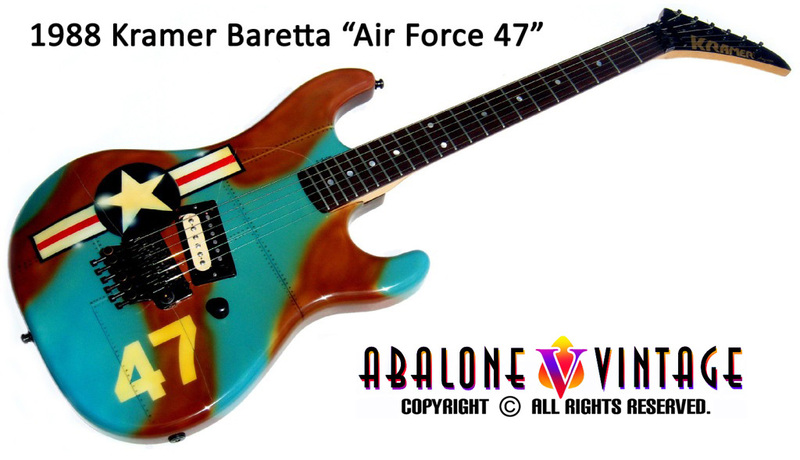 Vintage 1988 Kramer Air Force 47 graphic on a Baretta. which is common given the type and method of clear coating used. This Dennis Kline graphic is thought to be a one-of-a-kind. 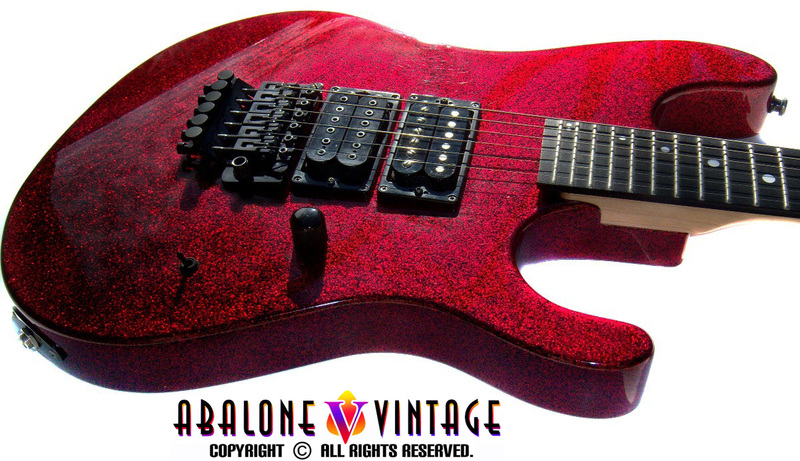 Vintage 1988 Kramer NightSwan guitar in spectacular red sparkle! but the sparkle red is the bomb! This is one of the more common of the airbrushed graphics....But quite the looker. one-of-a-kind. 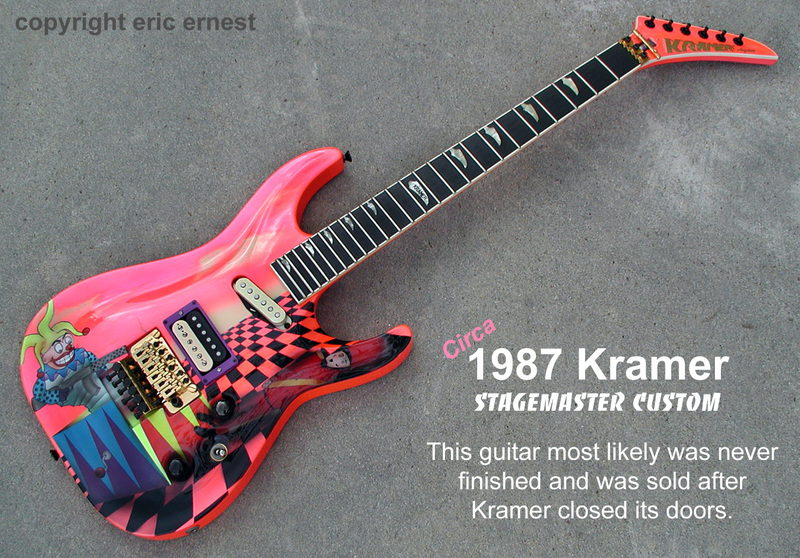 Kramer set neck guitars with graphics are pretty rare. 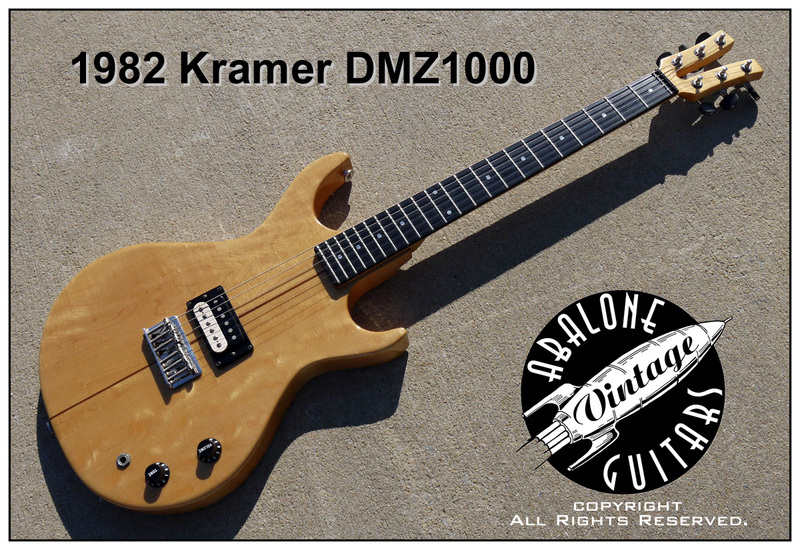 This guitar was most likely completed AFTER Kramer closed its doors. 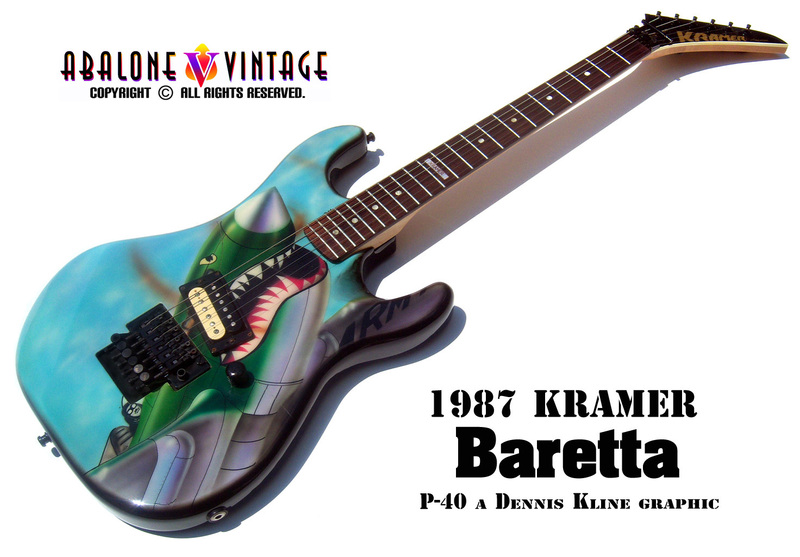 1987 KRAMER P-40 graphic by Dennis Kline on a Baretta. 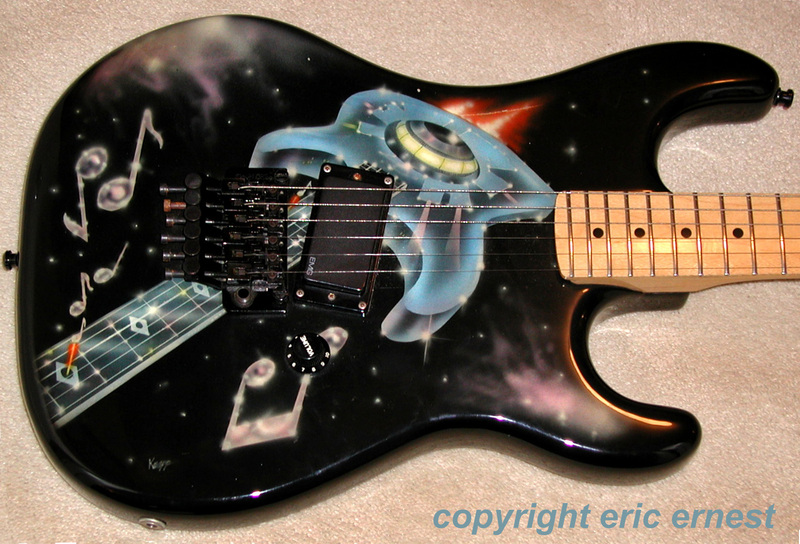 WWII fighter planes and nose art are somewhat common themes on 80's airbrushed guitars. This one is thought to be a one-of-a-kind. 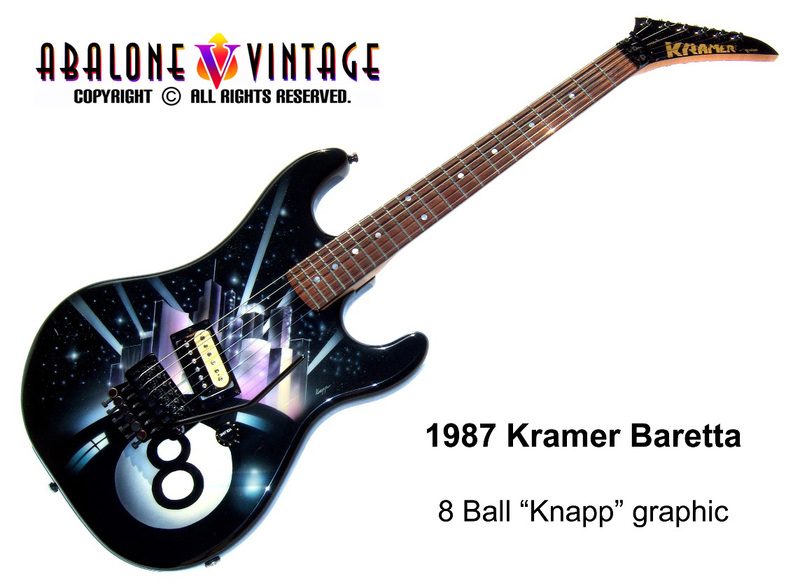 1987 Kramer with a Knapp "8 Ball" airbrushed graphic on a Baretta model guitar. This is one of the better Kramer graphics done. This "Knapp" graphic is thought to be a one-of-a-kind. 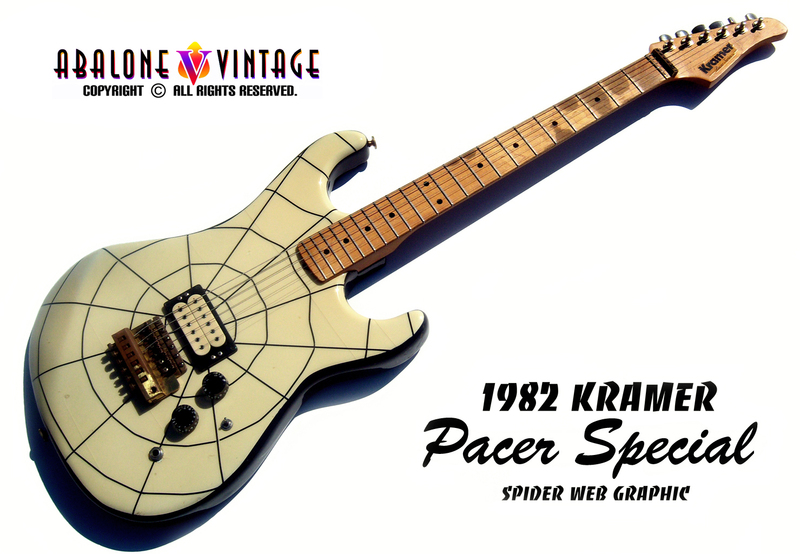 1987 Kramer Knapp "guitarship" graphic on a Baretta! This is one of the more common graphics....But also one of the better ones too. 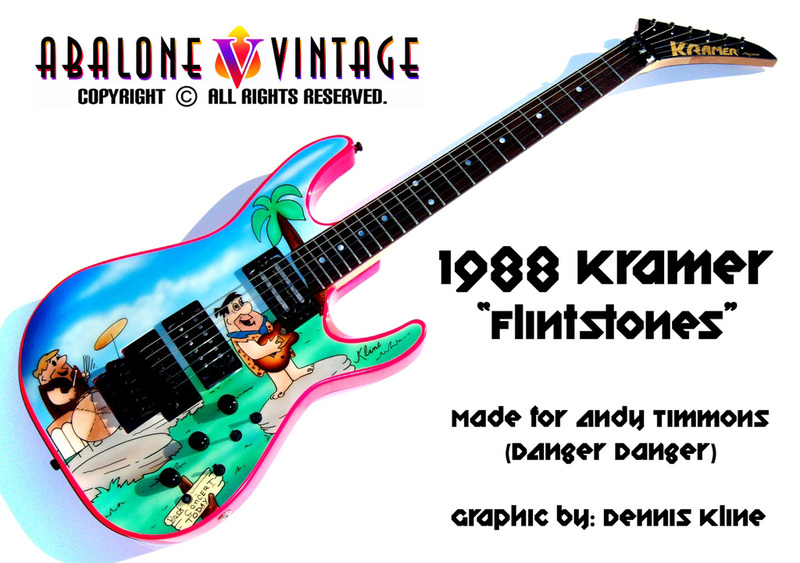 1987 Kramer Baretta with Dennis Kline graphic. I am not a big fan of the "Fantasy Series Night Scene" graphics. Not my vibe. 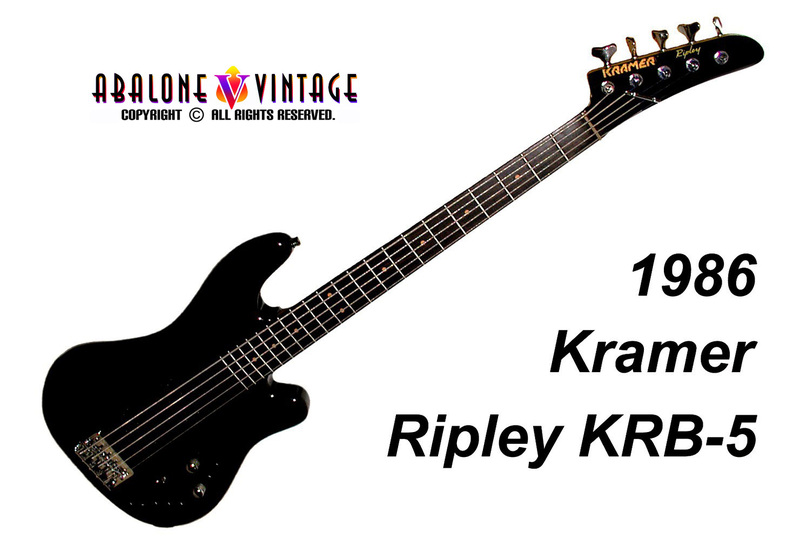 1986 Kramer Ripley KRB-5 bass guitar. Around 50 or so these were made. 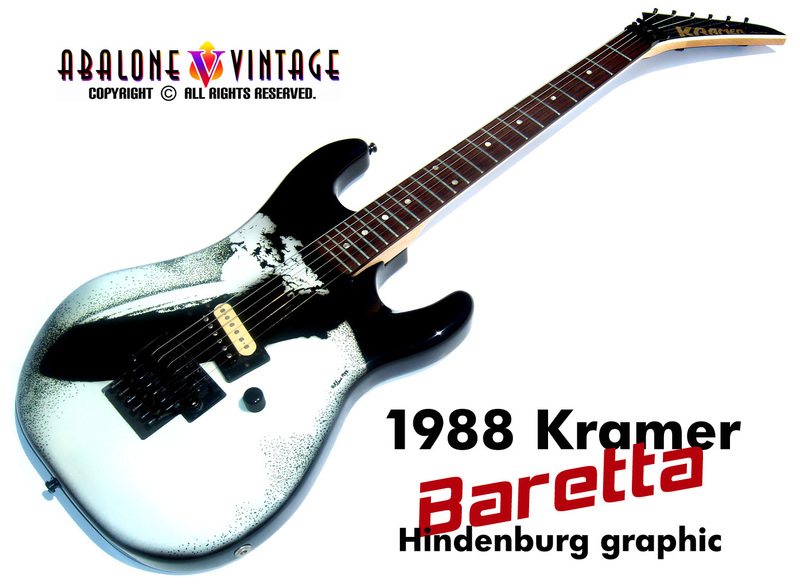 Vintage 1986 Kramer Baretta with Dennis Kline graphic. This is one of Kramers more common graphics...but pretty darn cool. 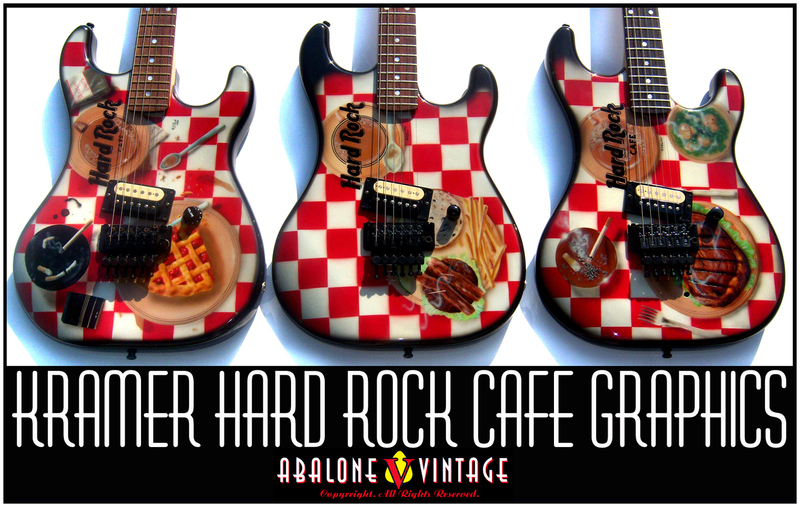 KRAMER Hard Rock Cafe graphics painted on Barettas by Dennis Kline in 1986. 80's There were supposedly four of these done. 1.) Breakfast. 2.) Lunch. 3.) Dinner. 4.) Dessert. 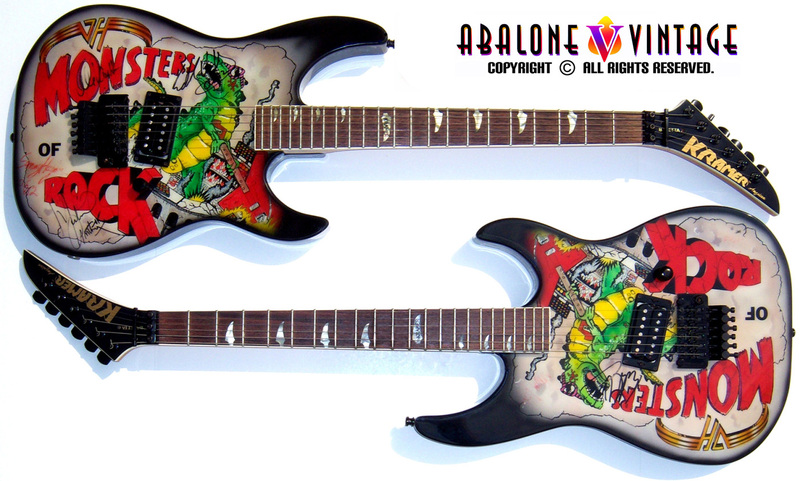 The desert guitar was shown to Eddie Van Halen at Madison Square Garden during their tour. 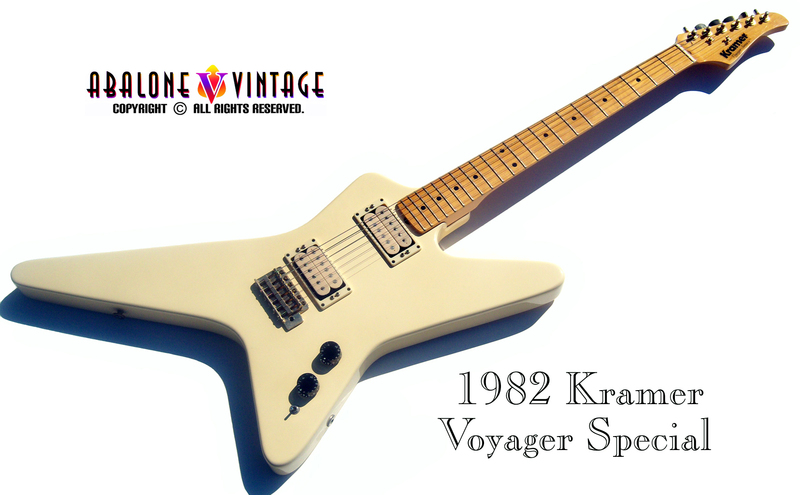 Previously owned by author Michael Wright and used in Vintage Guitar Magazine! This guitar was also used in the Boston Museum guitar exhibit. One of 12 or so made. 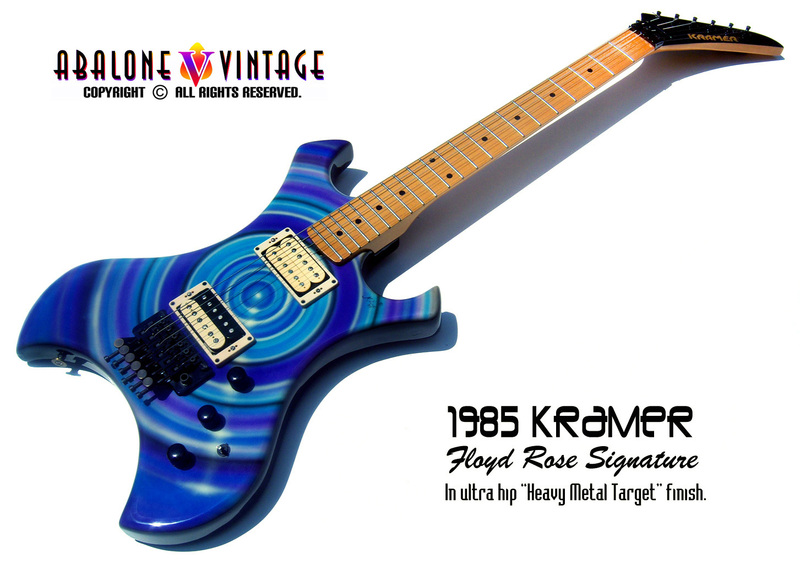 1985 KRAMER Floyd Rose Signature guitar with Dennis Kline "Heavy Metal Target" graphic. 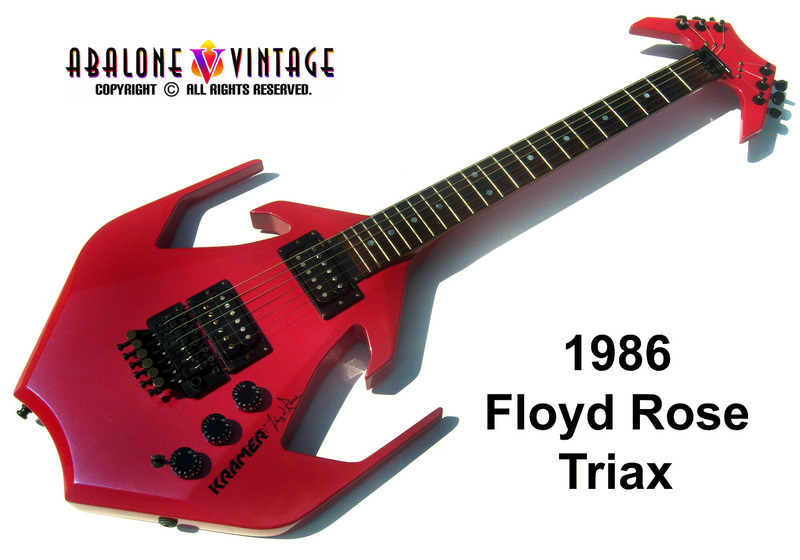 This is the only known Floyd Rose Signature guitar with a Kline graphic. The "Heavy Metal Target" graphic was done in a variety of colors. 1985 Kramer Baretta in white with maple board. These are pretty common in cream color...but white is VERY rare. Maple fingerboard is a nice additional rare feature. Barettas are a great, get it done, guitars! 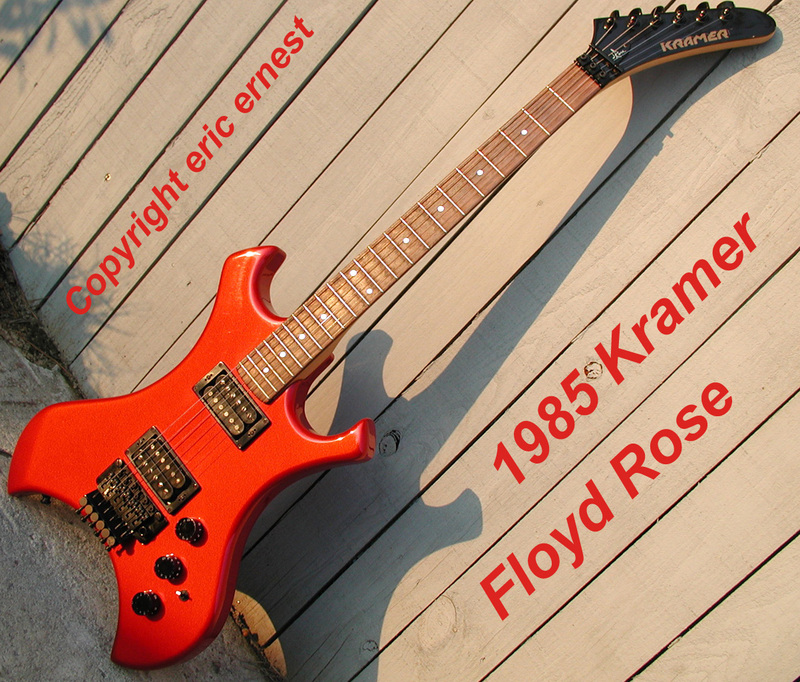 1985 Kramer Floyd Rose Signature guitar. These guitars are a lot of fun! The design makes changing strings a breeze. 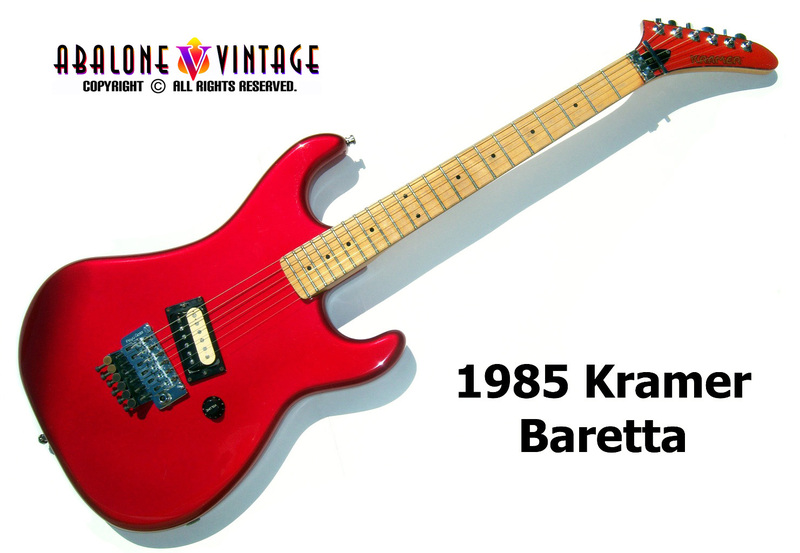 Kramer Baretta guitar from 1985 with a very appealing combination of features!!!!!! These guitars a quite a curiosity, but pretty useless for overdriven stuff. that's probably why later versions of this model had on-board "hex fuzz." Roland's GK2A made this guitar completely obsolete. 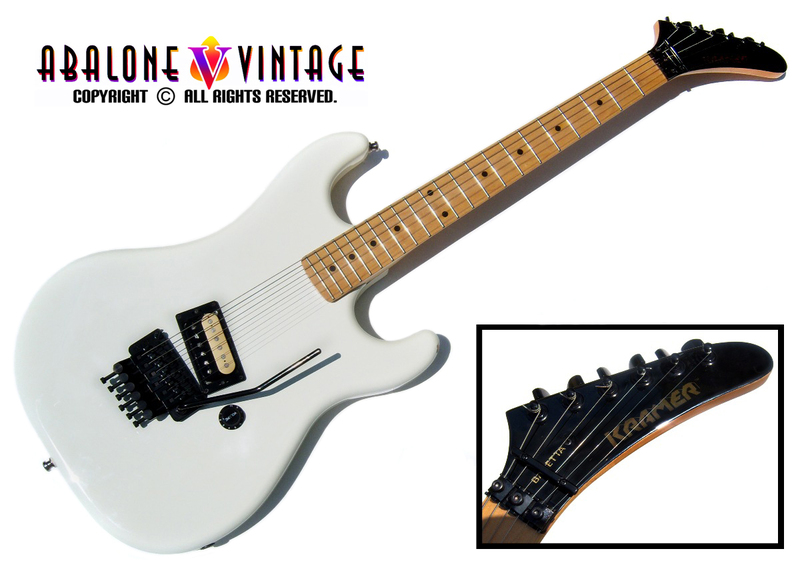 The Ripley model is the type guitar Edward Van Halen used on the terrific song, "Top Jimmy." 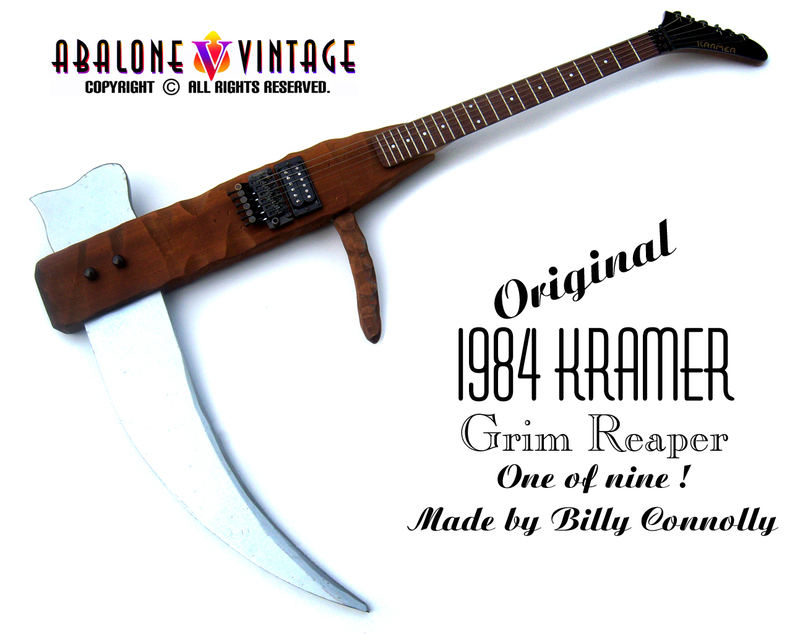 Made specifically for the band "Grim Reaper" for radio promo! 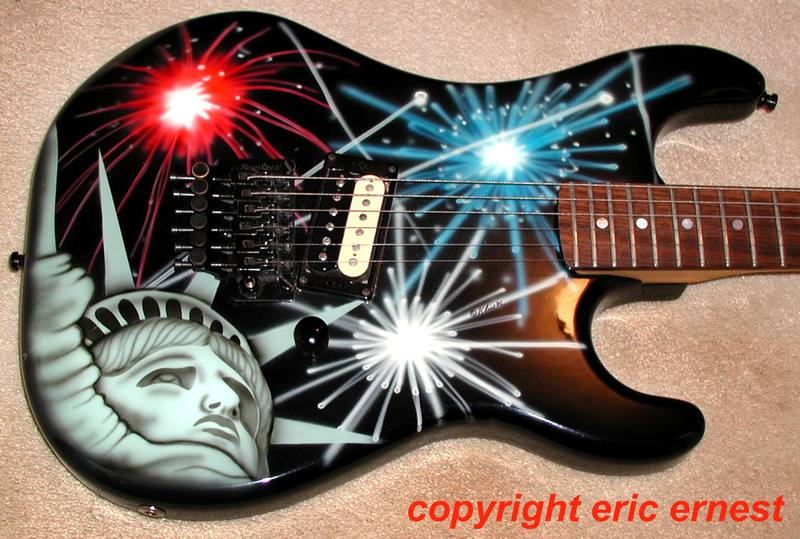 Made by the guy who made EVH's 5150 and 1984 guitars. This guitar was bought from Billy's widow, Kim. 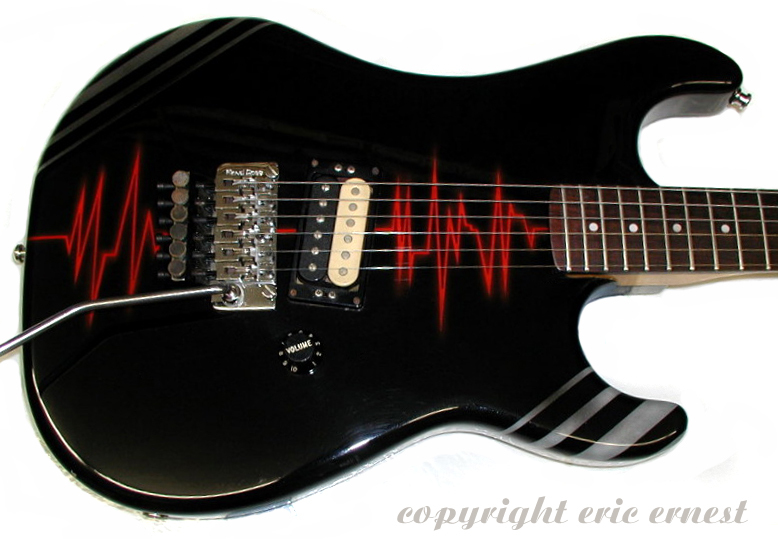 Kramer Baretta with unique one-off "Heartbeat" graphic on a 1984 Baretta. 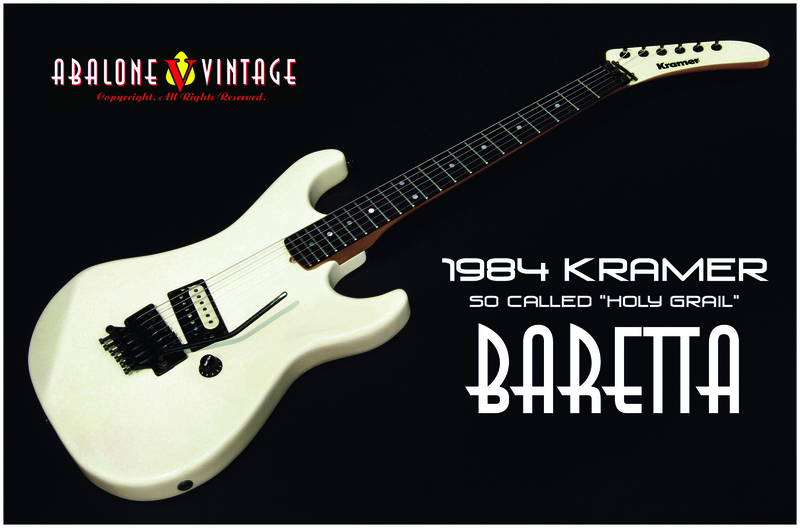 1984 Kramer Baretta model guitar which is also referred to as the "Holy Grail." Um, I'm thinking no. 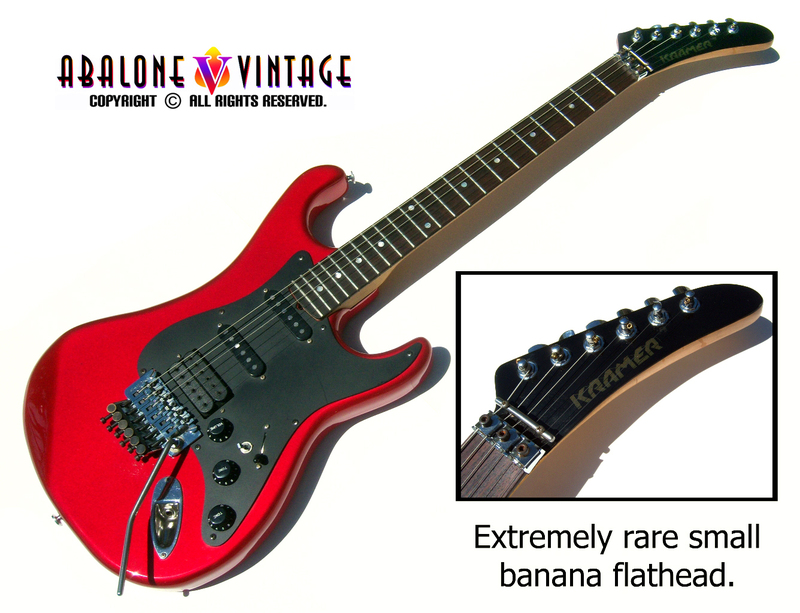 1983 Kramer Pacer guitar with stupidly rare small banana flathead. Blue Sky's infamous mural, "Tunnel vision." Columbia South Carolina. 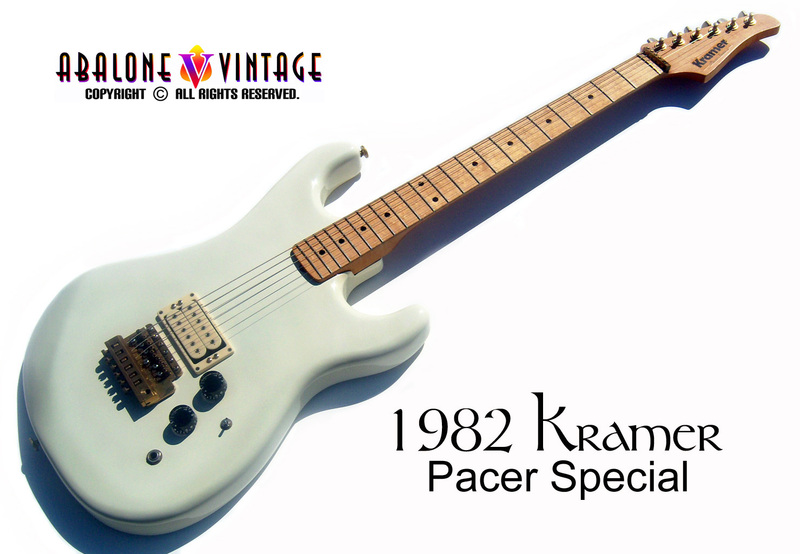 1983 Kramer Pacer guitars with stock graphics. 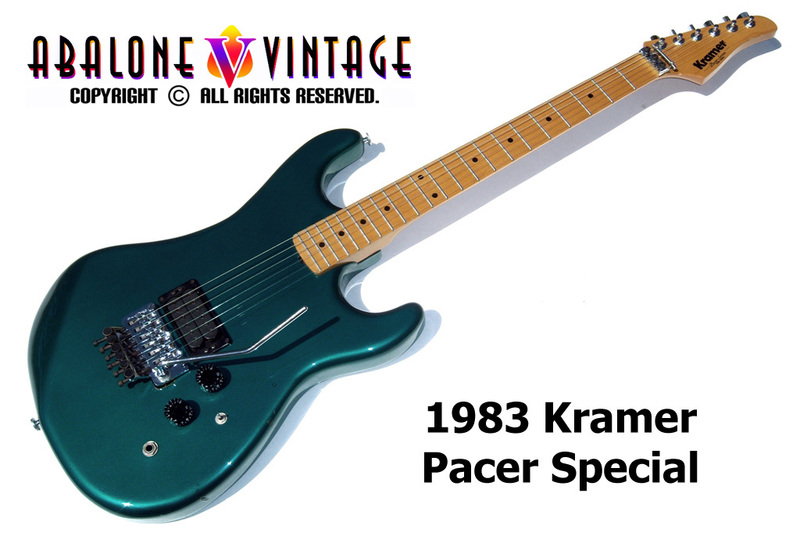 1983 Kramer Pacer Special guitar. 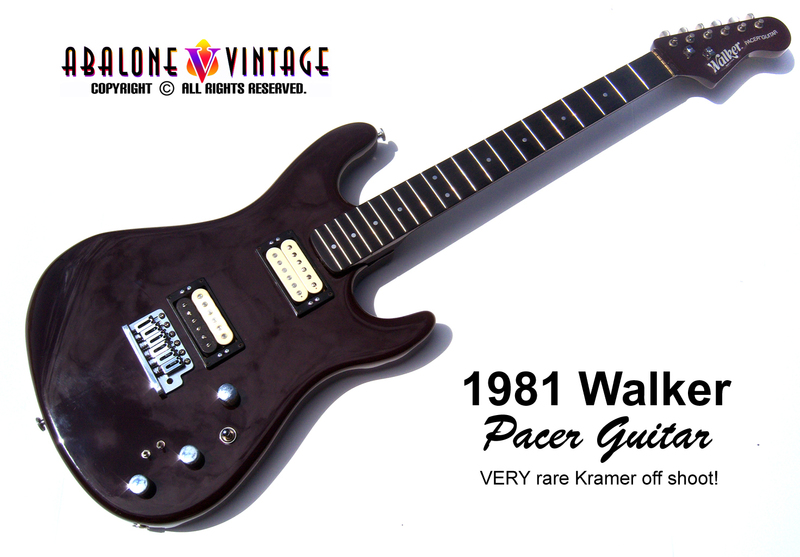 This is one of the earliest Pacers with a Floyd Rose bridge. 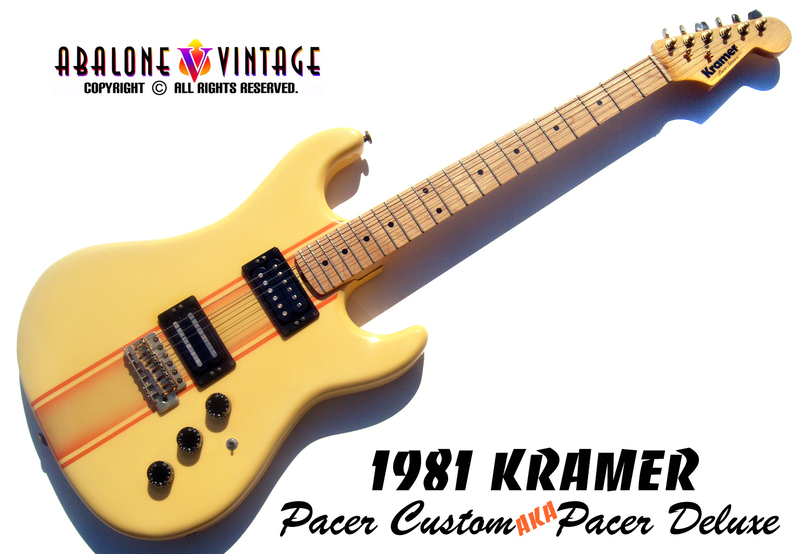 Kramer Pacer Carrera guitars with Rockinger Edward Van Halen tremolos. 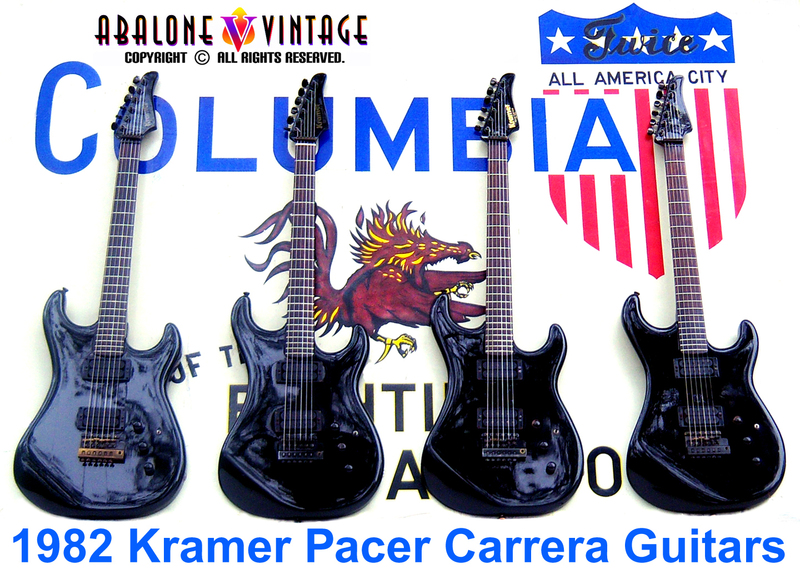 These four top-of-the-line vintage Kramer guitars were the most expensive model you could purchase. and double white Schaller pickup. 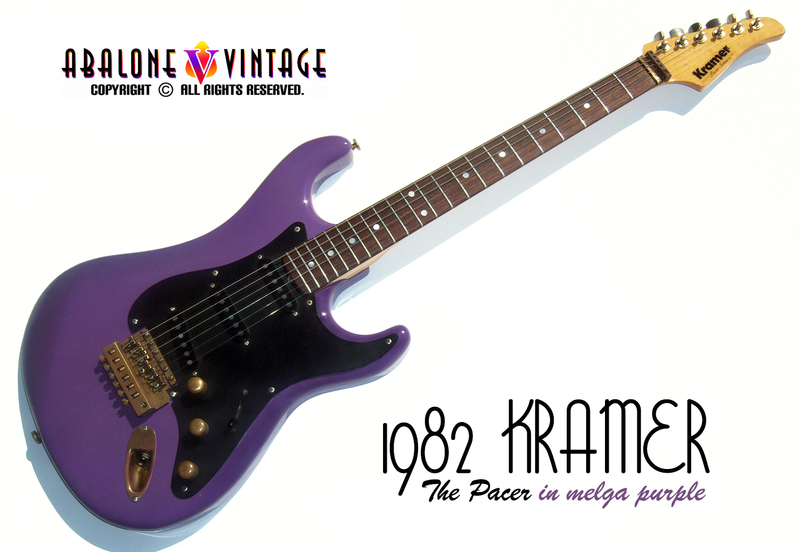 The only Melga Purple "The Pacer" known to exist. Brass EVH Rockinger bridge! ever couple of months or so. This is probably the only melga purple Strathead Voyager around! Killer guitar. 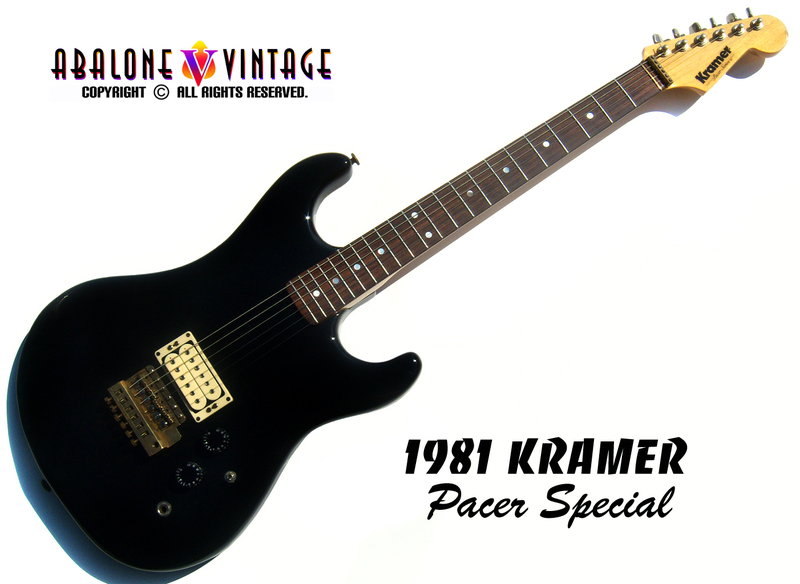 1981 Kramer Pacer Special guitar. Very rare Schaller non-trem. model! 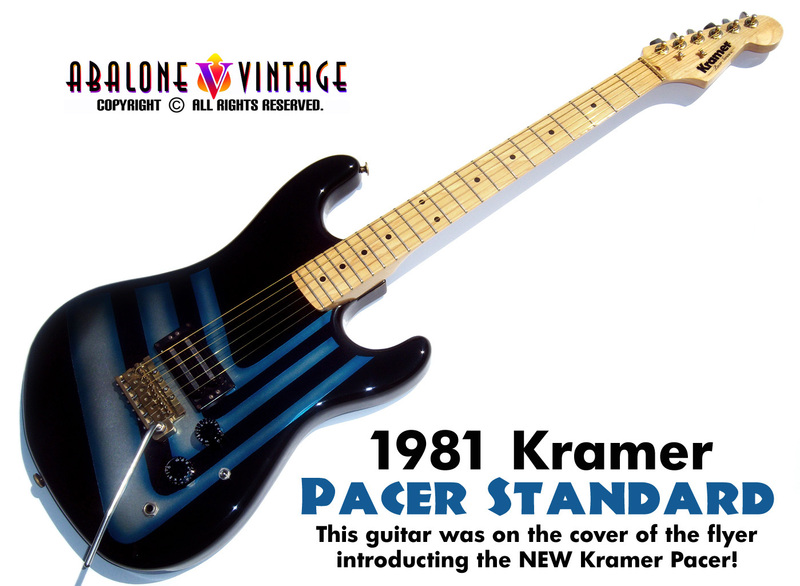 In fact, the only non-trem Kramer Strathead Pacer known to exist. Featherweight too! 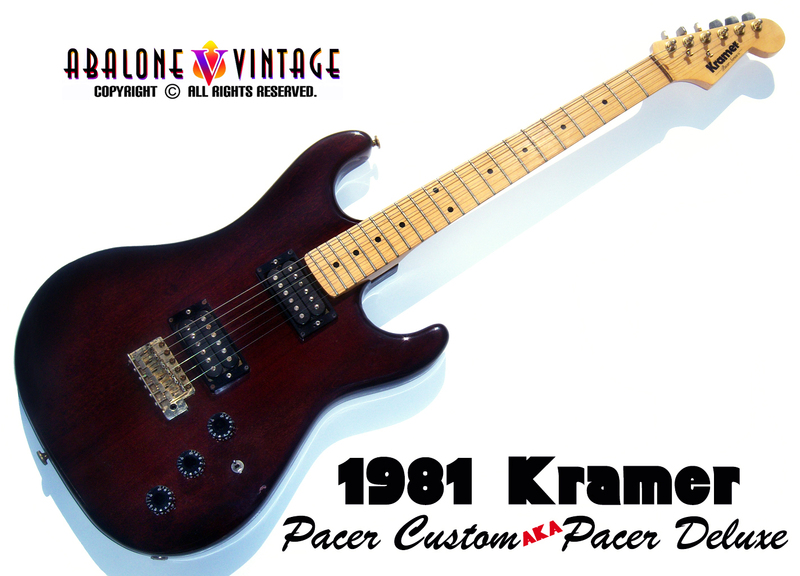 1981 Kramer Pacer Custom guitar. This guitar is stained walnut. The previous owner INSISTED the body was made of mahogany. After about five minutes I gave up trying to convince him otherwise. tremolo!!!! This color is VERY difficult to accurately capture with a camera! 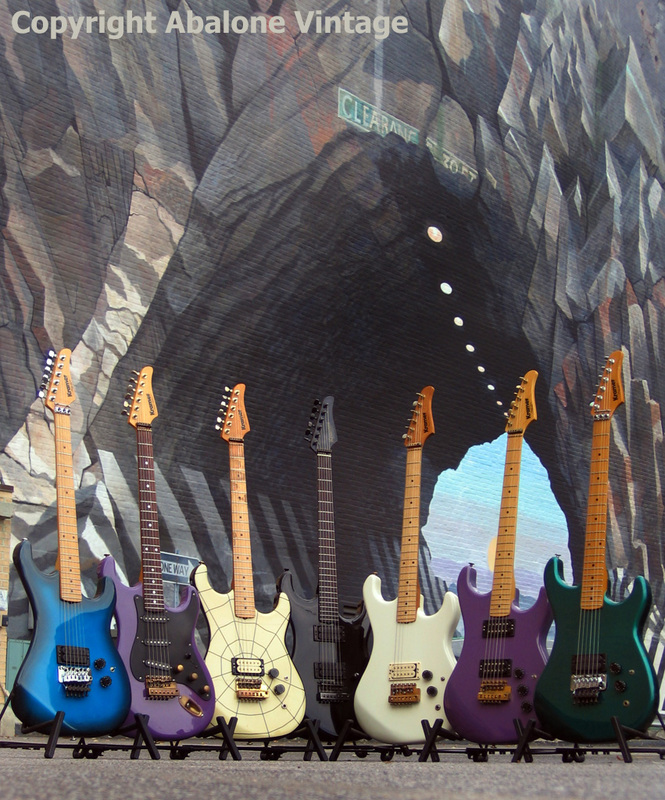 San Dimas Charvel Strathead counterparts! One of two vintage Rosewood board Kramer Stratheads known to exist. used on early black and white guitars. One of the FIRST wooden neck Kramer Pacer guitars. Catalog guitar. Body is actually a "Walker" using the same control rout as the aluminum neck guitars. This guitar could be called a prototype and was shipped to a dealer in England....It came back! 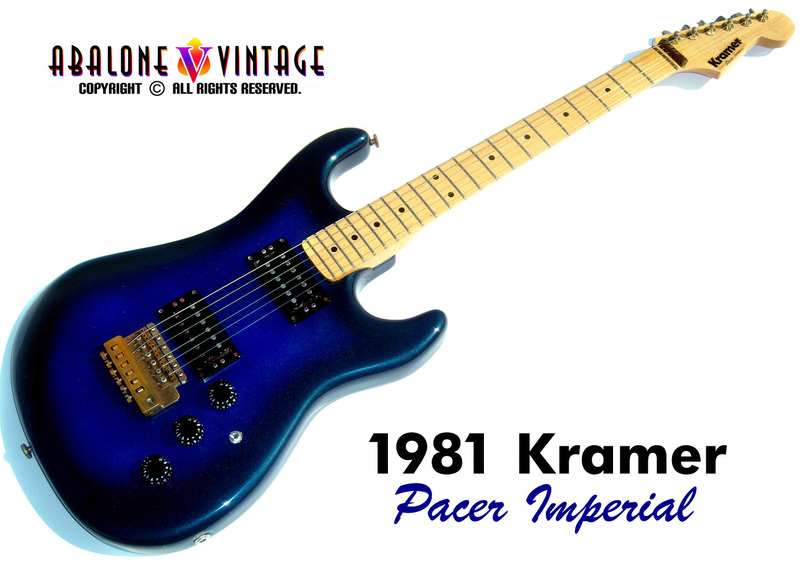 This is the predecessor to the Kramer Pacer that came later in 1981.